Everyone knows about the Chanukah story, the players, the war, the victory, and the oil. 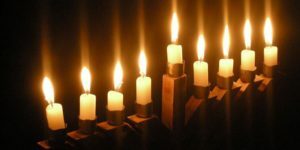 While researching for this article, I met some characters that I had not given too much thought to before, but greatly expand the relevance of the Chanukah message in our day. The Tefilla of ועל הנסים, describes the military victory as the strong being given into the hands of the weak, the numerous into the hands of the few. The next three phrases perplex the commentators. The impure into the hands of the pure, the evil ones into the hands of the righteous, and the sinners into the hands of those who are occupied with your Torah, do not seem to describe qualities that exist in a war situation, and seem to have nothing to do with the miraculous outcome of the war itself. Upon deeper deliberation, it seems that the phrases of “the impure were given into the hands of the pure…” are speaking about the spiritual war that the Greeks waged against the Jews. As the ועל הנסים says: The Greeks stood up against the Jewish people to make them forget about Your (ה׳’s) Torah, and to make them forget the laws of Your (ה׳’s) will. This was a spiritual war, no less impactful than the physical war that they waged with elephants and spears. I do not think that we can dismiss the spiritual miracles as being any less powerful than the military ones that the Jewish people experienced. Even though the Greeks initiated the decrees forcing the Jews to go underground in their practice of Yiddishkeit, there were quite a significant number of Jews who joined ranks with the Greeks either willingly or by force. They were called מתיוונים (Hellenists). The remaining numbers of Jews who continued to live openly as Jews were quite minimal. It seems then, that the problematic people who were “impure…, evil…., and sinners…” are referring to the Hellenists-those Jews who went over and fought on the side of the Greeks. So, the Chanukah miracle includes remembering and bringing back the Jews who gave up on themselves as being part of the Jewish people. What a powerful message then and probably even more so now. Chanukah provides the ideal backdrop for ensuring a Jewish education building lifelong learners and proud Jews. What measures are we taking in our schools to make a difference for our children who are swayed by the modern Greeks and Hellenists? What tools do we have today that are within our reach to win this war? Judy Willis is a neurologist who returned to University to become a school teacher and now trains educators, writes and lectures extensively on neuroscience and education. It is fascinating how the knowledge of how the brain responds to stimuli can impact student learning, test scores, attitudes and motivation. She writes in the Pearson Australia newsletter that “Research reveals evidence that all brains have the potential to become better and all students to become smarter, especially with guidance and encouragement.” (http://www.pearson.com.au/insights-and-news/the-future-of-education/judy-willis-science-of-learning/). It is not by chance that Chanukah and Chinuch have the same etymological root. In coming articles, I will address the importance of harnessing students’ strengths against their weaknesses, metacognition, brain plasticity and self-regulated learning. In this way, we arm and prepare our children/students to be שלהבת עולה מעליה (flames that rise from their own selves) self-motivated, passionate, and responsible lifelong learners and leaders of the next generation.